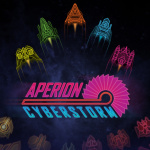 We first played Aperion Cyberstorm - by aPriori Digital - back in early 2015 as shown in the video above, and had a lot of fun with its stylish twin-stick shooting. That was on Wii U, but the realities of making games with limited resources and the rapid decline of the console saw it fall off the radar, which was a real pity. Well, the game is still very much alive, and it's now been confirmed that it is coming to the Nintendo Switch on the 8th of February; importantly it's still coming to the Wii U on the same day as well, so those with the previous system won't miss out. This bullet-hell shooter has various modes for single or multiplayer, with up to five people able to take part. On the Switch it'll support various configurations and controls, and in a particularly nice touch it'll have accessibility options including 'lefty-flip' controls and optional settings for resizing text, auto-fire and so on. Prototyping for Aperion Cyberstorm began development in October 2013 as a cooperative space shooter made with the XNA framework and in mid-2014 we decided to move the game from XNA to Unity. This then gave us the ability to bring the game to Nintendo Wii U. During the lifetime of the project, we have revised the release date more times than we would like. The reason for doing so is that we understand that the game may not make back its development costs, which is a reality that a lot of studios face, but we wanted to make a game we could be proud of and that can be played years from now by a variety of people of different abilities. 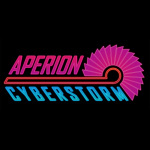 At aPriori we find joy in making games games and we are delighted to finally be able to bring Aperion Cyberstorm to market this year. The development process has really been a case of life imitating art - as a studio we’ve enjoyed the ride and we hope gamers will enjoy their virtual ride when they get their hands on the code in February! It's been a long time coming, but we can't wait to get our hands on Aperion Cyberstorm and we think it will be a great fit for the Switch. Let us know if you plan to pick it up with a comment below. I don't think I've heard of this before. I like the concept anyway. Heh, with the way Indies are doing on the Switch, the results may surprise them. Good Luck, folks! Always down for a good twin stick shooter but still nothing compares to the king: Robotron 2084!! Cmon Warner Bros!!! Haha your right we did miss our predicted launch as the game has become much bigger from when we did this interview with NL. The game features three main modes - Campaign, Versus and Onslaught (Arcade mode) and all have many modes within! The game has a lot of content and will keep players busy!